elementary, middle & high school age. Register for one or both weeks. Registration for a workshop is only confirmed when full payment and forms have been received. All forms and payments must be received by June 30, 2016. A separate registration agreement is required for each individual student. A 10% sibling discount is available. A $25 fee will be charged for returned checks. The fee and replacement payment must be paid by money order. All cancellation requests must be sent in writing to artonthecornerbr@gmail.com. There are no make-up sessions for absences. No refunds or credits are issued following the second class of each session regardless of whether further sessions are attended or not. Refunds requested before the workshop start date are calculated at 50% of the total workshop fee minus the Tuition Deposit Fee [$50]. Limited financial aid is available. At no time is rudeness, foul language, physical or verbal abuse, unsafe behavior, or actions deemed inappropriate by Summer Music Intensive staff, tolerated. These actions may result in dismissal from the Summer Music Intensive Program without warning or refund. [$50 non-refundable tuition deposit] made payable to Art on the Corner. • HAND DELIVER the form and check to Good Shepherd's Office [address above], 9AM-3PM, Monday through Friday. • UPLOAD the completed form and email to artonthecornerbr@gmail.com and complete the payment process below. Add a $50 Tuition Deposit for the desired week[s] to your cart. A $2 processing fee is added. Carefully choose the workshop and week[s]. ​ Please indicate name of student. ​ Tuition Deposit is required for each week registered. *Please note: Credit card transactions will appear as English Evangelical Lutheran Church of the Good Shepherd. Add the appropriate Tuition Fee to your cart. Carefully choose the workshop and week[s] based on date of payment. *$50 of the Tuition Fee is considered a deposit and is non-refundable. ​Pay in full by May 15, 2016 for a lower tuition rate. All fees and paperwork must be completed and submitted by June 30, 2016. ​ Add the appropriate Tuition Balance to your cart. ​ date of payment and amount of weeks. Please indicate name of student. 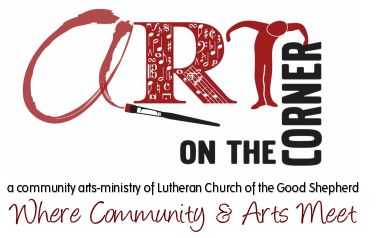 If you have any questions, please email them artonthecornerbr@gmail.com.